How Do Infrared Binoculars Work? Infrared night vision binoculars collect and amplify existing light, such as moonlight, starlight or infra-red light, through the objective lens, which is then focused on the image intensifier. Inside the intensifier, a photocathode is “excited” by the light and converts the photon energy into electrons. These electrons accelerate across an electrostatic field inside the intensifier and strike a phosphor screen (like a green monochrome TV screen) which emits an image that you can see. It is the acceleration of electrons, which provides gain and enhances the image. The image will be a clear green-hued amplified re-creation of the scene you are observing. All night vision binoculars need some light to amplify. Those binoculars with built-in infrared illuminators (IRI), like the Bushnell's listed below, allows you to see in complete darkness where no ambient light source, such as moonlight, is available. If the subject is to be viewed in a completely dark area, you just activate the infrared illuminator by pressing the IRI button. The IRI emits a beam of infrared light that is nearly invisible to the naked eye, but will be bright when viewed through the binoculars. How Far Can I See With Infrared Binoculars? That depends upon how much ambient light is present. For example, on a full-moon night, you should be able to see with no problem out to the maximum distance of the binoculars' range which could be more than 500 yards. In a completely dark area with virtually no ambient light present, you will need to use the IR illuminator. The IRI will typically allow you to see out to 100 yards or so. You will see the generation type listed in the specifications of your binoculars or night optics. They range from 1st Generation thru 4th Generation night vision with varying levels of each in between. 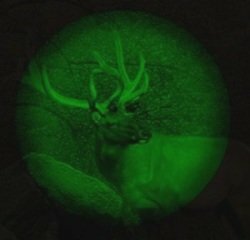 Gen 1 is currently the most popular type of night vision in the world. A 1st Generation unit will amplify the existing light several thousand times letting you clearly see in the dark. These units provide a bright and sharp image at a low cost, which is perfect, whether you are boating, observing wildlife, or providing security for your home. 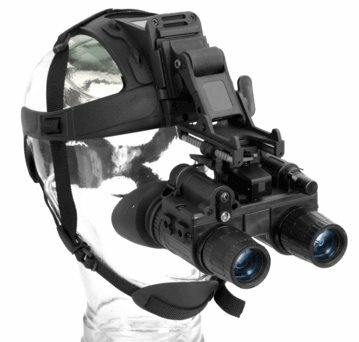 Gen 2 night vision goggles and above (Generation 3 night vision & Generation 4) is primarily used by law enforcement, military or for other professional applications. This is because the cost of a Gen 2 night vision unit is approximately $500.00 to $1000.00 more then a Gen 1. The main difference between a 1st and a 2nd Generation unit is the addition of a micro-channel plate, commonly referred to as a MCP. The MCP works as an electron amplifier and is placed directly behind the photocathode. The MCP consists of millions of short parallel glass tubes. When the electrons pass through these short tubes, thousands more electrons are released. This extra process allows 2nd Generation units to amplify the light many more times then 1st generation giving you a brighter and sharper image. Here are some well reviewed infrared binoculars that are at a really low price compared to other sites. 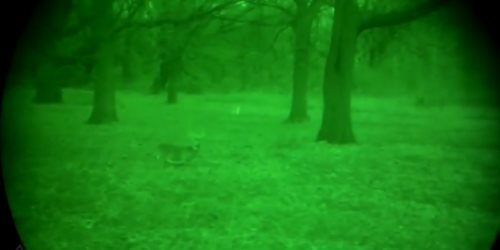 The Bushnell Lynx Gen 1 Night Vision Binocular are lightweight, have an extra wide field of view and the built-in infrared illuminator lights up the darkness like no other. 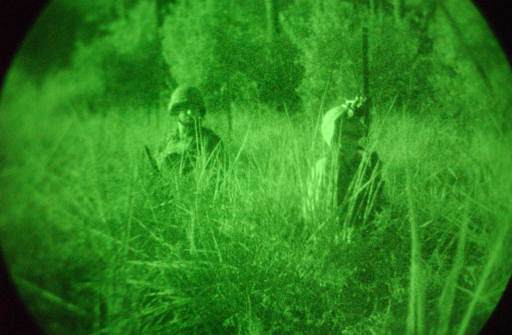 If you have a bigger budget (8K+), you may want to consider the ATN Gen 4 Night Vision Googles (PS15-4), typically recommended for military and law enforcement use. We hope you enjoy your infrared binoculars as much as we do. We have additional information about choosing the right bird watching binoculars or all around wildlife viewing binoculars and spotting scopes. Just follow the links below. There have been several occasions while camping or just in my own backyard where we had our infrared binoculars out just for fun and caught some great up-close glimpses of nocturnal avian life such as owls, nighthawks, nightjars and even roosting birds like hawks and even songbirds. Of course there are kinds of nocturnal animals you can spot too without scaring them away with flashlights. I've also used them on dark nights to walk down paths or for finding items in my campsite without having to disturb others by using a bright flashlight. I also enjoy looking at the stars and planets with them - I know a telescope is better, but night vision binoculars are more portable and I usually have them with me. I've also used to them when I heard noises outside my tent to see it's only a raccoon and not a bear without waking up everyone by using a flashlight.